Justin Rose surged into the halfway lead at the Hong Kong Open but is wary of the threat of fellow Englishman Ian Poulter who is two shots adrift. Rose hit a four-under 66 to move to nine under, once clear of Denmark's Lucas Bjerregaard, while Poulter is seven under after also shooting a 66. 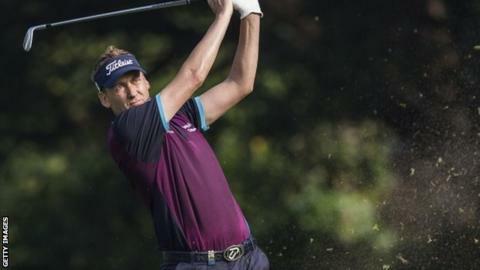 Poulter was a late entrant as he tries to save his European Tour card and chance of qualifying for the Ryder Cup. "Ian is always good when he's got something to prove," said Rose. "He's probably a dangerous guy now that he's outside the top 50 in the world because he will be desperate to get back in it." Poulter has played in nine European Tour events this season but dropping out of the world's top 50 on Sunday meant he would be ineligible for his planned appearance in next month's WGC-HSBC Champions event in Shanghai, thus leaving him unable to play in the 13 events required to retain his European Tour membership. Poulter, who won this event in 2010, only arrived in Hong Kong at 19:00 local time on Wednesday, having left Orlando on Tuesday morning. He said: "I know this golf course. I've shot 60 around here before. So although I did not play a practice round I've got good memories. "I've had a couple of top fives in the last five years around here as well. So I know the place, I like it, and hopefully I can have a good weekend." Rose dropped his first shot of the week on the penultimate hole of a round built around five birdies. However, he needed treatment afterwards for a hip complaint. "My left hip is really sore," said Rose. "I don't know what it is. I will have a bit of physio and try to figure it out." Starting on the back nine, joint first round leader Lu Wei-chih briefly caught Rose with a three successive birdies from the 17th before running up a double-bogey seven on the third and eventually signing for a one-under 69 to finish alongside Poulter.